This clock has a bright red, easy to read LED display with the day and date! No more forgetting what day it is. A quick glance at this Big Digit LED Calendar Clock will remind you. Our week is usually filled with appointments and daily chores. It helps to have a calendar handy to help us remember the day and date. 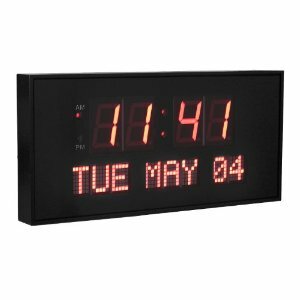 This makes the LED Calendar Clock perfect for the office, the kitchen or family room. Crystal clear and easy-to-read red letters and numbers stand out against a black background. The clock has a large, bright display that shows the time on top with the day of the week and the date along the bottom. A black frame completes a very contemporary look. The Calendar Clock can stand upright on a table or be hung on the wall. The AC adaptor (included) plugs into a recessed outlet on the back so the clock will still hang straight. Oversized LED Calendar Clock Details: Dimensions: 15.875 Inch W x 7.5 Inch H x 1.625 Inch D, Time display: 2.25 Inch H, Calendar display: 1.5 Inch H, 3 buttons on the back for setting the time and date, AM and PM indicator lights, Will not lose time and date settings in a power outage. The Calendar Clock makes a great gift for an aging parent, especially one with low vision or who has a memory issue. The big digital LED display provides this important information in a way that is so clear and easy to read they are sure to love it.